I have lots of lovely childhood memories of playing board games with my Dad and I REALLY want my children to have the same, so we are always on the look out for new games. 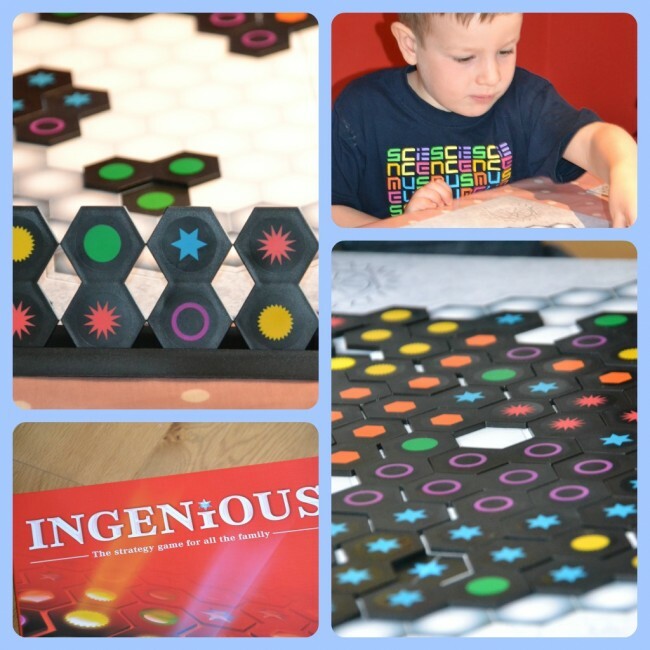 Z loves a game which make him think and he is remarkably patient and logical for a 5 year old. I was a little worried Ingenious would be too complicated for him, but he understood what to do straight away, although does still need a little help working out his score. We have played at least twice a day since opening the box, so he definitely likes it as do my husband and I. It is lovely to have a game that is fun and challenging for us and for him. As with some of the best games the rules themselves are simple. From a rack of six tiles you have to place matching colours to achieve the best score. There are six colours to choose from and you place your tile so it is connected to as many of the same colour as possible. For each colour you have a peg on a score board which you advance as and when you connect with other tiles of that same colour. The catch is that by the end of the game it is your lowest scoring peg that determines your fate. Leave behind a straggler and you will more than likely lose. The game board and pieces are high quality, it really is a great family game, I would definitely recommend it. Ingenious retails at about £24.99 and is recommended for children age 8 +. We received a Ingenious for the purpose of this review.